Editor’s note: This is the fourth in a series of posts by guest writer Ashkan Karbasfrooshan .Previously, he wrote about the State of Online Video, 12 Surprising Things Holding Back Online Video Advertising, and Context is King: How Videos Are Found And Consumed Online. In part 4 today, he examines where he thinks the sweet spot is for making money in onljne video. Karbasfrooshan is the founder and CEO of WatchMojo. Ten years ago, web companies didn’t generate much revenue. These days, web companies are some of the most profitable around. Online video is where the Web was ten years ago: in investment mode as video companies that are generating high revenue are not necessarily the most profitable. Brightroll’s CEO Tod Sacerdoti added: “I think by this time next year the majority of the top five to ten video properties by any measure will be aggregator networks. The best example for this is display advertising.” Indeed, networks have an unmatched ability to scale but can also crash to the ground awfully fast. The low margin is the least of their problems; differentiation and defensibility are. Blue Lithium and Right Media hit jackpots by selling to Yahoo! But those who didn’t sell (Tribal Fusion, Valueclick) suddenly found themselves under pressure from search advertising on performance and video on branding. 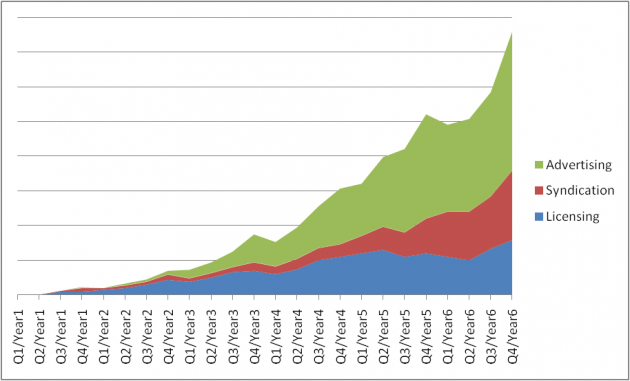 Similarly, aggregators gather videos from content providers, sharing ad revenues. iFilm (sold to Viacom, renamed Spike), Guba, Grouper (sold to SONY, renamed Crackle), Revver, YouTube (sold to Google), Veoh, DailyMotion, Metacafe, Viddler, blip.tv, are all vying for content, audiences and dollars. YouTube is master of this domain. Hulu is giving YouTube a run for its money, but the business model is anything but certain and its long term exit strategy is murky (Disney, News Corp. and NBC Universal/Comcast are shareholders but also competitors). 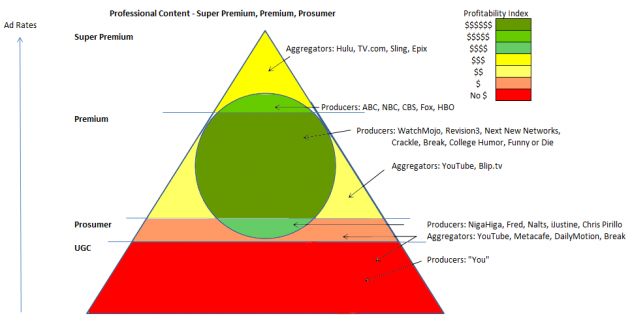 Ultimately, ad and content networks operate in a high-risk, winner-take-all game. For publishers, it’s a lower risk world. Consider the two acquisitions News Corp. made in 2005: Rupert Murdoch paid more for IGN ($650M) than for MySpace ($580 million), but MySpace’s subsequent growth made him look like a genius (for a while). Today, MySpace is searching for its raison d’etre while IGN treks along as an unstoppable force in its sphere. The Myth of Hyper Distribution? In online video, producers are agnostic to distribution channel or platform. To reduce risk, they diversify distribution, but the jury’s out on whether hyper distribution bears fruit. Hyper distribution refers to syndicating one’s content as broadly as possible with little or no restrictions. In theory, in the future when video streams monetize the way search queries have (whereby a search query is always associated with some kind of paid listing) then perhaps Wilson’s thesis will prove right. But in practice, at least in the five years that have passed since the post, it’s been a recipe for financial disaster. Hyper distribution is great for promotional purposes but not necessarily for commercial purposes. Marketers do pay more attention as an audience grows, but they also pay a premium for scarcity and exclusivity. This is the fundamental conundrum facing new media producers who rely on hyper-distribution to build brands and audiences but who weaken their pricing power and ability to secure guaranteed dollars by giving away their videos. This can work if you can build ad-supported businesses, but that takes time and money. Today, a few new media producers have managed to build ad-supported businesses, namely Revision3 and Next New Networks. But between the two, they have raised over $30 million in venture capital. Most producers don’t have that luxury. For those others, I recommend creating content that other media companies will pay for, to buy them enough time to build a syndication business and eventually, a fully ad-supported business which commands the large ad dollars. An imperfect but useful analogy I use is the banking model, where retail, corporate and investment banking fees can create a large business. a safe income stream: licensing, like retail banking, provides a recurring and non-volatile revenue base. a growth business: syndication, like corporate banking, requires other companies in the ecosystem to do well. This can provide higher CPM rates by placing content in the right context. a wildly lucrative stream: advertising, like investment banking, takes time to develop, is speculative and seasonal, and risks drying up abruptly. Notice how advertising revenue spikes each fourth quarter, for example. The reason why I place content producers in the highest Profitability circle over time in the first chart above is because only they can build such a business. (The Profitability Index represented in the chart takes into account operating margins and total return on investment, including likelihood of a liquidity event). And, yes, I am completely biased, since this is the kind of business I am trying to build with WatchMojo. Aggregators and networks are solely advertising based businesses; just ask YouTube who generated $10,000 in a paid model test, even though it can generate billions in simpler ways. Video advertising will be a bigger business, but not necessarily a higher-margin business. Video on the Web is no longer just about entertainment. It is also about marketing, instruction, and conveying information of all kinds. Content bellwether Wikipedia announced it will be rolling out videos soon enough. e-Commerce leader Zappos encourages users to submit their video experiences which increase sales 6% to 30%. In 2010, it will create 50,000 videos. It won’t be long before organizations feature their accountants, lawyers, management, VCs in videos too. Videos won’t simply be on all websites; video ads will converge with rich media and display banners. Publishers and ad networks will swap out low yield ad placements for videos that sell at a premium. Rupert Murdoch is right to say that there isn’t enough advertising to make all publishing online profitable, but if you insert a video-enabled ad where a display banner exists today, maybe it will become more profitable, as video rates tend to generate a tenfold premium over display banners. Of course, the flip side of that argument is that if video ad inventory lost all scarcity as display banners have, then it rates would also see a steep drop. Google’s dominance of the Web today stems from a perfect storm. Search benefitted from low expectations. Whereas Google’s competitors threw in the towel to focus on portaldom (or outright handed them the business), online video companies’ war chests seemingly have no bottom as they wage the war for the online audience. With YouTube being a unit of Google, it’s hard to compete being a pure video aggregator. Those who have tried are flailing badly. Yet video’s expectations have always been high and will only get higher. Video will follow search in two ways though. Search is software and Google is the only successful ad-supported technology company. Video is media, which has a natural disposition to embrace ad-supported models. As such, advertising will monetize video streams. In fact, as large ad agencies and marketers shift online, they’ll embrace branding campaigns and push video advertising could eventually top search advertising. Once that starts, online advertising will surpass television, it’s already happened in the UK. Everyone agrees that video advertising will be huge but what will the prevailing ad format be? Stakeholders are obsessed with finding the ad format likely to follow television’s 30-second ad spot and search’s paid listings. What might lead the way? But largely because they’ll get more user-friendly: the 30-second ad will make way for 5-10 second interactive pre-rolls (SpotXchange CEO Michael Shehan). However, there will always be properties which will forego pre-roll revenue to improve the user experience in order to build audiences, and all else being equal users will migrate to those sites. So I’m not sure the pre-roll will remain all that ubiquitous. The other problem with pre-rolls is lack of attention. When a pre-roll starts, I tune out and look for my headphones or go grab a coffee. That’s why I like the contextual display banner (and not necessarily the companion banner). A companion banner comes bundled with the video pre-roll, but sits alongside the video A contextual banner comes without the pre-roll. Whereas most banners disappear quickly next to text with one downward scroll of the mouse, alongside a video player, that banner becomes quite valuable and top-of-mind since people are just staring at the video. We’ve also seen the rise (and fall) of overlays, which is basically an expanded Picture-in-Picture (PIP) format; we know how that fared. Of course, content producers are also salivating over branded content (more than product integration and product placement, the brand becomes central to the story) or outright sponsorships. Finally, there’s the Web’s favorite offspring: the viral video. Viral video is not an ad format, of course, but it is not quite branded content nor is it supported by ads. As these become more common, achieving success with content alone becomes a sure-fire recipe for failure. All content will need to be supported by a media buy or some kind of promotional push. After all, on TV you spend millions creating an ad but you need to buy media spots to promote it. It’s not going to be that different online. Yes, it’s a meritocracy, but it’s a loud, cluttered one. There won’t be a single dominant ad format but the holy grail will prove simpler than expected. It always does. Remember Don Lapre’s infomercials? He would go on and on about placing “Tiny Classified Ads” in newspapers. I never thought much of those ads until Google’s adoption of (essentially) little text ads next to search results led to their explosive growth. Sometimes in business, the solution is simpler than you can imagine.